Taylor Graham's poetry captures the life of an exceptional man of the nineteenth century. Elihu Burritt, born into a poor Connecticut family, was acclaimed "The Learned Blacksmith" by the Governor of Massachusetts when it was discovered he had mastered 50 foreign languages while working at the forge. Corresponding with Longfellow and others, Elihu Burritt became one of the most ardent peace activists in his century, helping organize international peace congresses, campaigning for a Congress of Nations, international law, and a World Court. Born nearly 200 years ago, he was well ahead of his time. President Lincoln appointed him Consular Agent to Birmingham, England. In her inimitable style, poet Taylor Graham, portrays Burritt's passion for peace and the betterment of man's condition in 94 beautiful poems. This is truly poetry for history. Taylor Graham is a volunteer search-and-rescue dog handler in the Sierra Nevada. Her poems have appeared widely in small and university press, including American Literary Review, The Iowa Review, The New York Quarterly, Poetry International, Southern Humanities Review, and she's included in the anthology California Poetry: From the Gold Rush to the Present (Santa Clara University, 2004). Her book The Downstairs Dance Floor (Texas Review Press, 2006) was awarded the Robert Phillips Poetry Chapbook Prize. 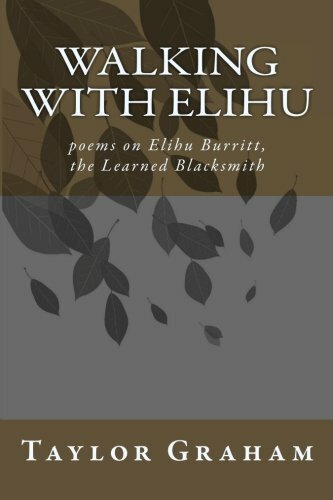 A small collection of her Elihu Burritt poems was a finalist in the 2010 Poets &amp; Writers' California Writers Exchange.